Kyozou is an all-in-one multi-channel ecommerce listing management solution and we don’t stop just at listing and inventory management. We automate the whole online selling process including order and shipping management. As your inventory sells, all of your orders feed into the same Kyozou account. Create invoices and manage refunds, print shipping labels and get discounted shipping rates all from one solution. Its instant order management at your fingertips. Kyozou saves you time, by setting up auto shipping processing rules a user can automatically print and generate a shipping label based on a sellers requirements. Kyozou helps you sell, pack and ship quickly to exceed your buyer’s expectations. Kyozou has direct integration with the most popular shipping couriers; USPS, Fedex, UPS, and Canada Post. With Kyozou you can calculate rates from the most popular couriers, incorporate and see your own shipping discounts and print labels. You can import custom tracking numbers in bulk and send notifications that your orders are closed and processed, sending all required information to eBay/Amazon, all from an excel file. Kyozou has integrated with e-commerce leaders to provide you with discounts. As your all-in-one e-commerce and inventory management solution, take advantage of seamless integration and instantly apply discounts to your order fulfillment. Integration of Discounts: Kyozou integrates your existing accounts with UPS and FedEx so that you can continue to apply your already discounted rates for your customers. All-in-one solution means you won’t lose any of the shiping benefits you already have, but Kyozou will help you get more. VIPParcel: VIPParcel offers the ability to purchase and print USPS postage online at significant discounted rates. As part of your subscription to Kyozou, we’re pleased that you can take advantage of the seamless integration that will not only process and ship your orders, but also print labels and apply the discounts with no additional steps. UPIC™: U-PIC™ Insurance Services and Kyozou have integrated to offer you worldwide shipping insurance up to 85% off. You can ship with the carrier of your choice, and take advantage of Kyozou shipping volumes to insure with U-PIC™ at a fraction of the cost. Manage payments from the most secure gateway systems with integration to PayPal and Authorize.net. Take payments over the phone, email checkout instructions, manage multiple PayPal accounts and refund PayPal/Authorize.NET payments directly from the software. Selling inventory offline? Not a problem, Kyozou has you covered. Create invoices and take payment directly through Kyozou. 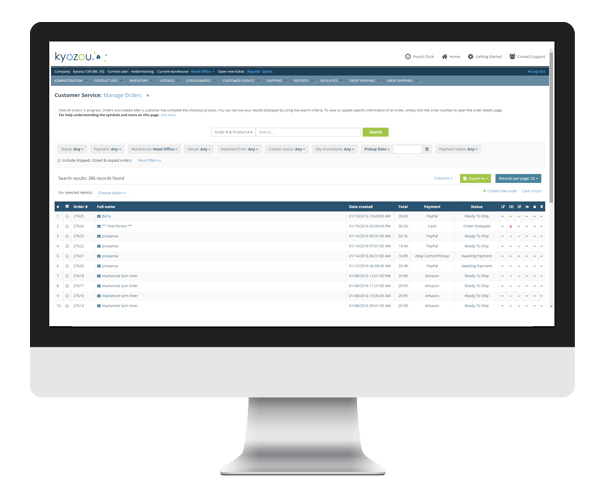 Kyozou has the tools to keep your offline sales up to date with your Kyozou account and keep inventory and sales reports accurate with offline sales activity. If you need to create an order for an already listed item, as soon as that item is associated with the order (and closed), the live listed quantity will automatically adjust itself.